So this always never fails to make me laugh out loud: I flip on the bathroom light to find Cosmo lying on a rug, in the dark. What's he doing in there? It's not a very exciting place, and there are way more comfortable sleeping surfaces in other parts of my apartment. 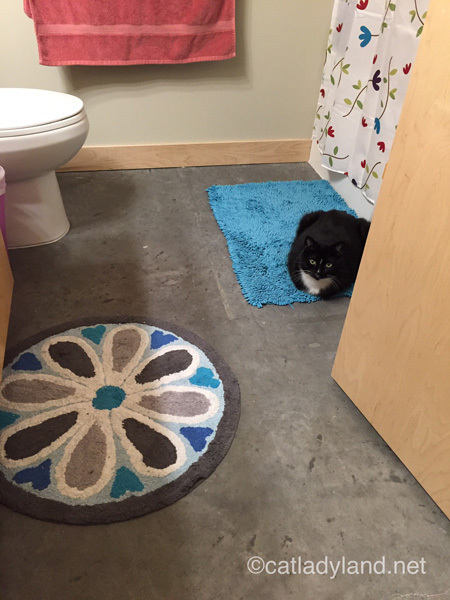 It's not warm, and even if it were, it seems like he'd loaf on the concrete floor. I ask him, but -- as of this writing -- he's offered no good explanation for his dark-bathroom getaways. So I look at him, laugh, and then go about my business. Maybe I should try a nap on that rug. Perhaps it's like Aladdin's magic carpet and I'll have some kind of crazy flying dreams? Maybe. What I see when I flip on the light. Oh hai.